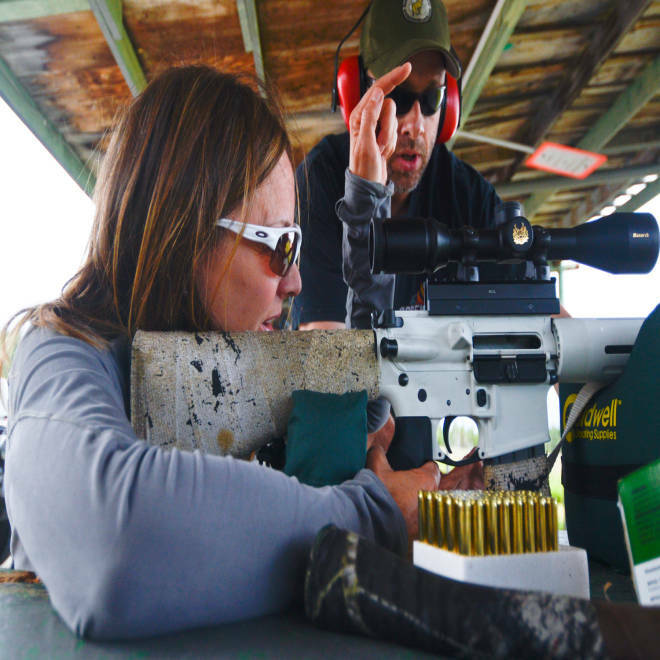 In this Saturday Aug. 3, 2013, photo Kym Cross gestures down the shooting range as Loren Reese helps her aim an AR-15 during a Women on Target class at the Snowshoe Gun Club in Kenai, Alaska. It has become one of the most popular — and one of the most infamous — weapons in American history. The Colt AR-15, often known as the assault rifle, has captured the imagination of gun enthusiasts who are drawn to its sleek form, portability and ease of use, as well as a mystique born of its connection to the M-16, its combat cousin from the Vietnam War. Part of the appeal of the firearm stems, as one gun aficionado told NBC News, from the ability to “accessorize it like a Barbie doll," given extras like interchangeable optics systems and gun barrels. Its military pedigree and appeal to hobbyists has helped spur sales of 5 million AR-15s in the last two decades, with most of those buys coming in just the past six years. According to industry figures, nearly one of five guns sold in the U.S. is now a semi-automatic AR-15-style rifle. Yet the AR-15-style rifle has also been used in many of the mass shootings that have stunned the nation. Adam Lanza used a variant of the gun to kill 26 people — 20 of them children — at an elementary school in Newtown, Conn. last Dec. 14. 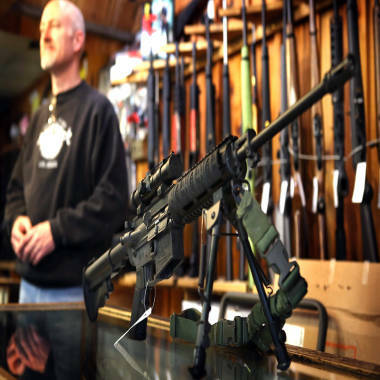 An AR-15 style rifle sits on the counter by Craig Marshall as he assists a customer at Freddie Bear Sports sporting goods store on December 17, 2012, in Tinley Park, Ill. Months earlier, James Holmes allegedly opened fire with the weapon in a movie theater in Aurora, Colo., killing 12 people. And suspected L.A. airport gunman Paul Ciancia, accused of killing a TSA agent and wounding three others, allegedly fired dozens of rounds inside LAX with yet another iteration of the gun, a Smith & Wesson 223 M&P-15 assault rifle. The shootings have sparked calls to revive a lapsed federal ban that outlawed military-style semi-automatic weapons and their features, notably high-capacity, detachable magazines. But even with the renewed drive to ban them, AR-15-style rifles appear to have attained a level of cultural currency rivaling the six-shooter that “Won the West” and Dirty Harry’s .44 Magnum. The AR-15 was designed in the 1950s by ArmaLite, a division of Fairchild Engine and Airplane Corporation, to sell to the military as a replacement for the clunky rifles of World War II, the M-1 and M-14. But despite the futuristic lightweight design, the U.S. military didn’t want it. By 1959, Fairchild had sold the AR-15's manufacturing rights to Colt Firearms. Colt embarked on a marketing blitz. It courted the military, and won its first important convert with the man who became famous for the phrase “bomb them back into the Stone Ages." In 1960, Curtis LeMay, then U.S. Air Force vice chief of staff, was invited to a demonstration of the rifle using watermelons at a birthday party for a Fairchild exec on a Maryland farm. "When struck by the little rifle’s ultra-fast bullets, the first two fruits exploded in vivid red splashes," wrote journalist C.J. Chivers in his book "The Gun." "General LeMay was so impressed … that he spared the third melon; the party decided to eat it." In 1961, LeMay became Air Force chief of staff. Under LeMay’s influence, Defense Secretary Robert McNamara ordered thousands of the weapons for the Air Force and for the military’s special forces. Other branches of the military followed, and the military version of the gun became known as the M-16. By the late 1960s, with the Vietnam War in full swing, the gun was a fixture among infantry soldiers, despite widespread reports of jamming, and a grudging belief that the Russian assault rifle used by the enemy, the AK-47, was a better fit for jungle warfare. 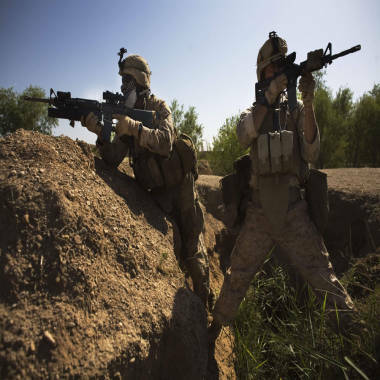 In this Friday, March 19, 2010, file photo, Navy Corpsman Michael Lang, of Camden County, Ga., right, with an M-4 carbine, and Lance Cpl. Ard Bizahaloni of Pinon, Ariz., with an M-16 rifle, with the First Battalion, Sixth Marine Regiment, take up positions as their patrol is fired upon, in Marjah, Afghanistan. On the civilian front, however, sales of AR-15-style guns were not spectacular until recently. Even as sales of hunting rifles have fallen, industry stats indicate that sales of guns based on the AR and AK platforms — so-called assault rifles — have spiked since 2007. More than half a million of the guns have been purchased annually, with numbers soaring to 1 million in 2009 and hitting 1 million again in 2012, according to the National Shooting Sports Foundation. The pace shows no sign of slowing. According to a recent NSSF survey of gun owners, the rate of ownership of “modern sporting rifles” — the industry rejects the term "assault rifle" — “has increased dramatically since 2010.” Half of all “MSR” owners had bought their first MSRs earlier this year. The rest were adding to existing collections. In 2011, 19 percent of all guns purchased were MSRs. “It’s got a bit of a Walter Mitty factor to it,” Reitz said, recalling the meek character of fiction and movies who loses himself in heroic daydreams. Josh Sugarmann, executive director of the Violence Policy Center, an anti-gun-violence group, said that pro-gun forces have turned their marketing and lobbying might to military-style weapons to counter a long-term drop in overall gun sales. They’ve found a new pitch to gun enthusiasts, he says, that combines military code words like “honor” and “duty” with a heavy dose of fear. Neither the NRA nor Colt responded to requests for comment. 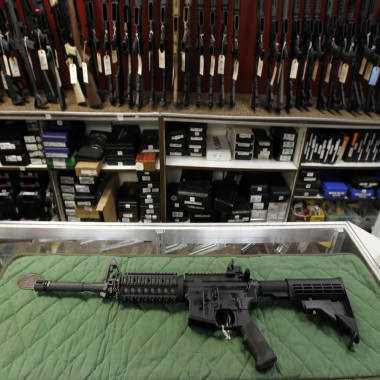 An AR-15 style rifle is displayed at the Firing-Line indoor range and gun shop, on July 26, 2012, in Aurora, Colo., six days after a shooting inside a crowded movie theater nearby. Chuck Michel, a California attorney who has defended gun owners and vendors in numerous cases, disputes the contention that the AR-15 sales pitch winks at the conspiracy-minded. He says the weapon’s accuracy, light recoil and simplicity give it a versatility that few other weapons can match. Despite high-profile shootings, the AR-15-style rifle is not found at many murder scenes. According to the FBI’s Uniform Crime Report, of the 8,855 homicides committed with firearms in 2012, only 322 were known to have been committed with any type of rifle. The report does not describe the type of rifles used in slayings. But Tom Diaz, author of the “The Last Gun: How Changes in the Gun Industry Are Killing Americans and What It Will Take to Stop It,” said the stats don’t change the fact that the AR-15 and its imitators and descendants were designed for law enforcement and the battlefield. Read and vote on readers' story tips and suggested topics for investigation or submit your own.